One of the biggest hunting seasons in North America is goose hunting. Most hunters see Canada geese as the ultimate in waterfowl sports hunting. Besides the result of a successful goose hunting expedition is an excellent, succulent roast goose, which is an extra benefit. Several strategies can be used to make sure a successful goose hunt. The following five tips will be useful no matter where you are goose hunting, but keep in mind that it is always a good idea to do a bit of research before goose hunting in a location that you are unfamiliar. In goose hunting, it is important to remember that the body size of the goose is misleading with regards to the actual vital area of the bird. Typically a goose’s critical area is only about 1/10 of the total bird size, so your shoot should be both accurate and efficient. A 10 to 12 gauge shotgun with BBB, BB, 1 or T-shot is considered the best set-up. It is important to check the shot density at about 30 to 50 yards to make sure that those pellets are staying in compact formation at this distance, especially if you are shooting geese on the fly. Goose hunting is very different from other waterfowl or upland game bird hunting. Geese are very nervous and observant by nature, and will not usually fly into a body of water if they notice disturbances or unusual objects such as hunters, trucks, tents or other items around the water. Blinds that are camouflaged can help reduce this “disturbance” and will make sure that geese will land in the bodies of water that you are hunting. Blinds typically need to be mostly camouflaged from above, and often simple canvas blinds work very effectively. When placing decoys out from the blind be sure to place them in a pattern that is accurate. Geese will typically land very near decoys providing they are acting like geese should. A “U” shaped pattern is ideal, especially if the bottom of the “U” is closest to the decoy. The geese will often land at the ends of the “U” and then swim towards the center, bringing them in closer to the blind. 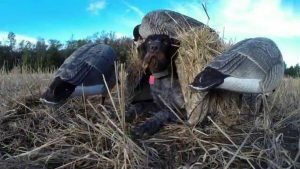 If the blind is camouflaged, it is possible to have the bottom of the decoy set 6-10 feet from the blind, provided the ground is not too swampy, to be able to sit that close to the edge of the water. Understanding the patterns of flight that the geese are using can help you in determining where and when they will be flying. Typically geese will feed during the early morning hours and the afternoon, and often knowing when and where the flock is likely to be at the given time of day will help in getting set up and locating yourself in an ideal location. Typically two or three days of observation is all that is needed to get a good handle on the movement of the flock. Goose hunting calls are not as easy as trying to mimic any sound make by the geese. There is a distinctive feeding call, flock call, and excitement sound, all which are very different. Learning both to mimic the calls and use the respective call at the right time is critical to being able to attract the flock. For example, using a flock call to bring geese to decoys is ideal, but using the feeding call would be less effective as this would be unnatural to the flock, usually resulting in them flying off rather than landing. Learning these five basic steps in goose hunting will help you with the basics of getting started in this exciting sport.